I love autumn – the season of crunchy leaves, open fires, new boots and chunky knitwear, but for me as for around 7% of people in the UK, the drop in temperatures and shortening of days also heralds the start of the SAD season. It can take a while for people to realise that the symptoms they have actually add up to Seasonal Affective Disorder, but once you make the connection it can suddenly make the way you feel in Autumn/Winter make a lot more sense and give you the tools to start to make it better! One of the difficult aspects of SAD is its seasonality – you can find yourself re-educating yourself on how to deal with it each year as you get 6 months where it’s not an issue. For me , this isn’t necessarily a bad thing as I have to evaluate and plan a new strategy for the upcoming 6 months. This means that I add new coping strategies each year (and republish this blog post! ), so I thought it was worth sharing some of them here for anyone who is just finding out they have SAD, or finds that they have the more common, less severe Winter Blues and just feel a little more sleepy, more down during the darker months. 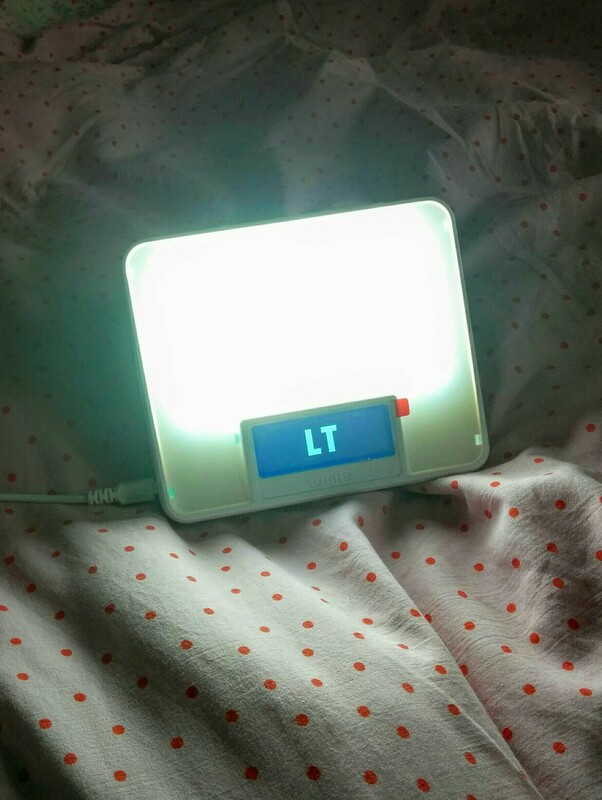 Light up your life – I would sleep for half the week if I didn’t have my Lumie light boxes (if I have a day without one I generally sleep through about 15 hours of the following day). The initial outlay is quite a lot (upwards of £100) but it is totally worth it; it only takes a day or so of lamp time to make a big difference to how awake you feel. I swear by them so much that I now have three – one for work, one for home and one for travelling. Make the most of every chance to get light you can – go outside at every opportunity no matter how cold it is or how lethargic you feel, even if it’s just a walk around the block at lunchtime it will help. In desperation, 10 minutes in the lighting department at John Lewis can have a little pick me up impact! Fill your house with lights and throw open the curtains. Green things – Your body will be telling you that all you need are chocolate digestives. Sometimes you should give in, sometimes you will need the sugar hit. However it’s obviously not ideal to exist on a diet of biscuits and what you eat can really help with your energy levels when you have SAD so while it may be the last thing you feel like, eat healthily – lots of veg and lean protein. There is some research to say that SAD sufferers actually need and can benefit from carbs more than most people, and other research that points towards being gluten free as something which helps (I tried this last year and it did make me feel like I had much more energy) – just test things out and see what works for you. Run away – When all you want to do is curl up in a duvet, the idea of putting on your gym kit and heading out of the door can seem impossible, but it will make so much difference that it’s really worth looking for ways you can fit exercise into your life. For me, that’s making sure that going for a run stays in the diary and happens, lots of walking whenever there is an opportunity to, and making sure I drag myself to the mat for every yoga class. It’s easy to get into a cycle of having no energy so doing no exercise and therefore having no energy, but if you push yourself just the first few times you’ll soon break the cycle. Fitting in exercise will boost your energy, help you sleep better, help with anxiety symptoms and work to combat the times you do give in to the biscuit cravings. Talk about it – I can’t stress enough how important this is. Talk to your friends and family, talk to your colleagues, talk to your boss, talk to your doctor. You will find things much easier to deal with if the people in your life know what is going on and what the reasons are behind any random mood changes / late cancellations / emails at 8am saying you just can’t come in / presentations where you completely lose your chain of thought / blinding light that appears as your constant companion. I do this in a very matter of fact way as soon as I feel the symptoms starting, telling people ‘I have SAD – the lack of light means I have less seratonin and more melatonin, so I will get less happy and more sleepy’ – going into more detail for people who need to know it (close friends & family, line manager at work). As well as benefiting you, talking about it also may help other people with similar difficulties to see them as something they can be more open about, starting to help break down stigmas about mental health issues. Talk to your doctor as early as you can so that they can start to put together a treatment plan – you might start to feel worse as the days shorten and so it will be better if you’ve already started to have the SAD conversation with them. Sometimes the drugs do work – I was absolutely against the idea of taking antidepressants, I wanted to deal with things myself. Until one February when I couldn’t get out of bed for 3 days, my SAD was diagnosed as severe and I was prescribed SSRIs (I currently take 50mg of Sertraline daily from late August til late March). They’re not supposed to properly kick in for about 4-6 weeks, but after 1 I could already feel the difference and couldn’t believe I’d not ‘given in’ sooner. I still need my lightbox for the tiredness, but the terrible anxiety and generally feeling like I’m rubbish at life has gone. I’m now quite philosophical about it – my body isn’t producing enough seratonin so I’m taking medication which helps it, just in the same way a diabetic would take insulin. I’m not saying everyone should take antidepressants (and for those who do, different types will work for different people), but if you’re really struggling it’s definitely worth a try. Vitamin D and magnesium are also supposed to help with energy, so I figure I may as well take them too! And before I started on the SSRIs, I was taking 5HTP (available from Holland & Barrett) which did seem to be having some small positive effect. Fly far, far away – I have no intention of staying here throughout a whole grey, British winter again. So in the absence of anyone offering me a job where I get to spend September – March somewhere sunny, I will be planning a holiday for the end of January/start of February instead – I’m hoping it will be a little beacon of light to look forward to after Christmas, and by the time I get back I will be in the home straight. Look at your lifestyle – the reason that I’m a month later publishing this in 2016 than I was in 2015 is that I’ve changed where I live and I’ve changed my job. This is totally not possible for a lot of people, I realise that – but if it is then it is so worth it. Going from a tube commute to an office with no natural light to a 20 minute drive commute to a job where I’m out and about more – having more time where I’m in natural light during the day is something which has made a massive difference so far this year. So if there is any way you can switch up your lifestyle to add some more natural light during the day, do it. Be realistic – No matter what you do to try to combat your symptoms, there will still be days when it doesn’t work, when your limbs feel attached to the mattress and the idea of having to tell anyone you can’t make it into work is verging on terrifying. It’s important to accept that this will happen and you shouldn’t feel bad about it – it’s an illness. So just go back to sleep for as many hours as you need and trust that things will get better. Don’t plan to take too much on at this time of year – look at how to ‘chunk’ tasks so they are more manageable and you don’t end up feeling even more hopeless that you’ve not finished something you planned. This can be as simple as planning to tidy a room a quarter at a time in case you don’t have the energy for the full thing at once – great if you manage all 4 quarters, but if you only do the first one that’s fine.